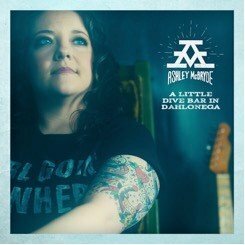 Already dubbed an “Arkansas red-clay badass” by Rolling Stone, Ashley McBryde arrives at country radio today as the most added new artist and most added female with her debut Warner Bros. / Warner Music Nashville single “A Little Dive Bar in Dahlonega.” The track, which hit No. 1 on SirusXM’s The Highway Top 30 earlier this year, describes finding a much-needed musical pick-me-up in an unexpected place. No stranger to the stage, McBryde has already toured with some of the biggest names in country music, including Chris Stapleton and Eric Church. In conjunction with her early success with “A Little Dive Bar in Dahlonega,” the singer / songwriter will set off on select dates of the Sirius XM Presents: The Highway Finds Tour alongside label mates High Valley this Wednesday, October 18 in Washington D.C. Her eight cross-country dates will continue into November and include stops in New York and Nashville. Find the most current Ashley McBryde tour dates from our partners at Country Music On Tour, your trusted country concert ticket source! Country Music News Blog participates in advertising programs that help fund the operation of this site. For more information please visit our privacy statement. This entry was posted in Ashley McBryde, New Music, Press Releases, Videos by Shauna "WhiskeyChick" Castorena. Bookmark the permalink.